Today (2/7/2019) I messaged Zev Shlasinger (formerly of Z-Man Games, creators of Merchants and Marauders), who now is part of their board game department. Inspired by the annual “State of the Union” address, as the arguable leader of the current Pirates CSG community, I hope to make this an annual tradition. 2018 was a very dark year for the game of Pirates CSG. The potential closure of Miniature Trading prompted me to create a new forum on this website, which is an upgraded version of my old Weebly site. The community has become somewhat fractured, although it was already like that before the Miniature Trading crisis hit. However, there is plenty of good news. 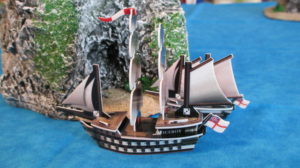 The forum at Pirates with Ben is up and running, and Miniature Trading is still alive! Various parts of the community grew in the past year, with the Facebook group surpassing 200 members and the Discord server being created. However, the scattered community is part of the reason I plan to do things mostly on Pirates with Ben going forward. Plenty of content is still being created, between my youtube channel and the Pirates CSG Podcast. It is quite possible that 2019 will see a bit of a decrease in video and audio content overall after the explosion of those in 2017 and 2018. Of course, there is still plenty to talk about, and plenty of games to play. There is a lot of uncertainty in the Pirates world going forward. After a slight dip in some prices, it seems that the market is still one for sellers, with the Shui Xian recently auctioning for $79 and an Obago Deuce commanding a whopping $500 on eBay. Regardless, it seems like a great time to finish the decade strong! Last night (February 3rd, 2019), myself and many others witnessed a thoroughly unsurprising event. Tom Brady won his 6th Super Bowl ring, further extending his legacy as the greatest player in the history of football. As he always does, Tom proved the doubters wrong. After his previous success, especially the historic comeback against the Falcons in Super Bowl LI, NO ONE should have been betting against Tom Brady. He is the god of football, and now there is simply no debating that. 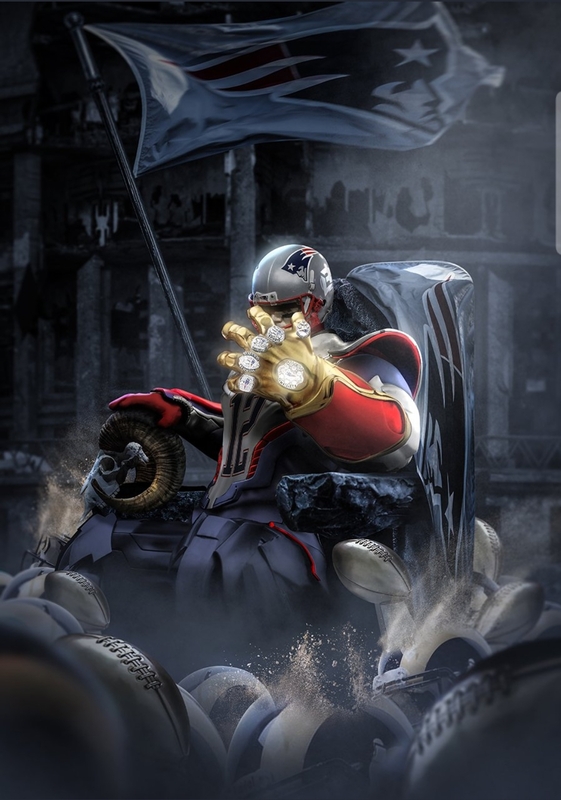 With his 6th championship ring, Tom Brady now has as many Super Bowl rings as Thanos has/had Infinity Stones. At any time now he could do a snap and erase half of all people, or perhaps just half of the NFL. XD Tom is now 6-3 in his nine Super Bowl appearances, breaking a tie with Charles Haley for the most championships by a single football player and moving into a tie with the Steelers for the most championships of any TEAM. After winning VASSAL Campaign Games 1, 2, and 3, I became “the Tom Brady of campaign games”. This is because Tom was 3-0 in his first three Super Bowls, and now I am 3-0 in my first three non-solo Pirates CSG campaign games. You can see how I did it in my Epic Videos playlist. CG4 has begun, although it is likely to last FAR longer than any of the previous VASSAL campaign games. There are a number of additional parallels between Tom’s Super Bowl legacy and my own campaign game legacy. CG1/2/3 were all played in a 2 year period from February 2016 (start of CG1) to March 2018 (end of CG3), which covers the three calendar years from 2016-2018. It took Tom only 4 years to accumulate 3 wins, similar to how it took me only about 2 years (and one month) to accumulate 3 wins. In terms of opponents, Tom was a massive underdog to the Rams in his first Super Bowl (SB). Xerecs and I faced off in CG1, the first-ever VASSAL campaign game. It could be argued that neither player was really a favorite or underdog. I did not control the best faction in the game, the Pirates, nor the French, another very competitive faction. I ended up winning as the Spanish, dominating the game in general. The Patriots were the favorites in Tom’s second SB, just as I would have to be favored to win CG2 against 2 other players. The Patriots were also the favorites in Tom’s third SB, just as I would be to start CG3 (as the most successful and experienced player in that game). A more stark contrast lies in the margins of victory, which are necessarily opposite due to the nature of the radically different games. Tom’s Super Bowls are pretty much always decided by a tiny margin, often by 3 points. With the shortest VASSAL campaign game (CG1) requiring a full 3 months of play to finish, and with Last Fleet Afloat rules in effect, it’s inevitable that my CG wins would be lopsided at the finish. However, there were some close moments, notably when the Pirates nearly attacked the Spanish in CG1, when the Pirates had a points lead over the English in CG2, and when multiple factions had better starts than the Americans in CG3. Tom has already stated that he will not be retiring, so a potential 7th ring is already in his sights. While CG4 and the Caribbean game slowly languish on, I have turned my attention to The Hourly Campaign, a solo campaign game, for want of players. Thanos will presumably look to defend his Infinity Stones in Avengers: Endgame. Here is my hype video for VASSAL Campaign Game 4. 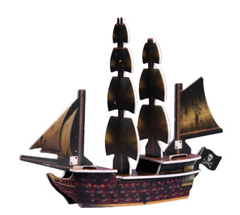 If I can win it in due time, I would be 4-0 in Pirates CSG campaign games. Sweet Spot – Best Mast Count for Ships? HMS Viceroy, an average English 4 master. Sweet Spot For Mast Count? A day ago I was randomly pondering if there’s a kind of “sweet spot” in terms of a specific ship type or especially a specific number of masts. Obviously each mast number has tons of great ships associated with it – but could one be called the “best” or slightly better than all the others? I contend that ships with 4 masts are just about right. This category includes many of the best ships in the game, and this ship size and point cost is the perfect amount for both gunships, gold runners, and especially hybrids. I could go into more detail, but I’d be interested to hear others’ opinions. Tough to beat one of the best ships ever – the Pirate hybrid Darkhawk II. I’ve always had a huge soft spot for 5 masters – they are my favorite ship type. However, they’re generally used in more of a gunship role. Based on the search function, there are more than twice as many 4 masters as 5 masters, so that speaks to the flexibility of 4 masters (an unfair advantage in this discussion perhaps, but a fact nonetheless). There just aren’t that many purpose-built 5 master hybrids – as good as the SC and Swallow are, a lot of people will still understandably use them as pure gunships. Also, there aren’t any 5 masters with more than 6 cargo spaces, while a few 4 masters have more than 6 (and plenty of 4’s with 6 as well). 5 masters are generally the truest gunships, while 4 masters are (in general) better hybrids while still holding their own in a line of battle full of 5 masters. What is your opinion of the gameplay “sweet spot” in terms of mast count? And why?? A game in progress during VASSAL Tournament #2. Wow! After last night’s 5 games played with xerecs on the VASSAL module as part of Tournament #2, I’ve tied my plays record for a single year at a whopping 75! 2011 was essentially half a year’s worth of playing, since I mostly did HFS’s prior to June 2011. Things ramped up soon afterwards, culminating in a whopping (I love that word lol) 75 in 2013. February 2013 still stands as my most active month, with 43 total plays. That was partly because of a tournament and the Acorazado vs. Endeavour one-day deathmatch series. After 26 plays last month I’ve got 16 so far this month, putting me on pace for about 30 (likely less though). The 43 plays in a month isn’t likely to be broken anytime soon. However, it makes me wonder which month was my highest for total hours playing Pirates. It could certainly be June 2015, since I played Economy Edition nearly every day, and the game literally started on 5/31 and ended on 7/1, almost perfectly encompassing the whole month of June. 2014 was like my “dark year”. I was less active in terms of playing (with less plays than even 2011), as well as other piratical activities. 2014 was also the only year I didn’t play a huge campaign game (regular in 2011, RISK in 2012, CotE in 2013, EE in 2015, CG1/CG2 in 2016). I then rebounded in a huge way in 2015, and expected to hit around 50-60 plays this year, which would establish ~55 as the number I would shoot for in future years (indeed, my average is 54 per year right now). (Since 2011, 2013, and 2014 were aberrations.) But, the World game has been delayed, leading to two big tournaments! The tournaments are definitely the biggest factor leading to the new record, and it’s quite possible 2016 will be my biggest year for a long time, possibly ever, in terms of total games played! I might hit triple digits! I record plays on BGG when a decision is reached (aka the game ends), so technically I’ve already broken my record because CG2 hasn’t been recorded yet! Though, the record will “officially” be broken soon, likely with the next T2 game, which funny enough features Norvegia heh. I like numbers and statistics (*at least for Pirates stuff! lol), so I wanted to make this thread. It also previews some of the end-of-year stuff I have planned. I actually finished 2016 with a whopping 92 plays, which stands as my single year plays record. 2017 was another big year with 76 total plays, making it my second highest single year for plays. 2018 was another dark year but almost inevitable given that the VASSAL tournaments were over and I wasn’t in a position to play many physical games either. However, I’m glad I’ve been able to do considerable campaign game playing recently, and hope to continue that with The Hourly Campaign. As the title says, what are the factions that fight each other the most in your games? Which rivalry has the bloodiest history? Story time! For me, it has to be Spanish vs. Pirates. For some reason, they almost always seem to be at odds with each other. It’s not on purpose at all, and never has been. I’ve had plenty of the classic English/French wars and plenty of different wars between all the factions, but the Spanish/Pirate rivalry is so consistent, legendary, and brutal that it has to take the cake. My “Guide to huge games” thread has links to all the different huge games (1,000+ points total) I’ve played in the past, which I will reference here. The Spanish and the Pirates have been at it since the very beginning. My first two packs contained two Spanish ships and two Pirate ships! My first cumulative game from 2011 was most memorable for the war between these two great factions. The Pirates hated the Spanish so much in that game it was unbelievable. They attacked in full force and effectively forced the Spanish out of the game, although it was partly due to other factions getting involved as well. The Pirates went on to repair their battle fleet and win the game, though the Spanish were the early favorites. Then came the first 5 player 500 point game. The end of the game was controversial: Davy Jones’ Divine Dragon managed to sink two Spanish galleons right before they docked home gold, giving the Pirates a 48-45 victory! This further fueled the Spanish/Pirate rivalry, with the Cursed acting as a temporary sideshow. Until the legendary Economy Edition game! After forming an alliance with the Franco-Spanish, the Pirates then proceeded to break their promise in the biggest betrayal in Pirates CSG history. That, coupled with non-allied attacks by the Americans and Cursed, wiped the FS from the game at the hands of the Pirates. This was the ultimate disrespect for the Spanish, and they were sick and tired of being on the losing end of things. VASSAL Campaign Game 1 changed all that. The Spanish Empire flourished, and the Pirates weren’t ready. The Spanish swept down upon the Pirates at their fort, winning the Battle of the Devil’s Maw and later the battle at the Pirates’ home island. It took a long time, but the Spanish finally eliminated the Pirates and went on to win the game. It was a well-deserved victory for the Spanish, and between the records they set along the way (biggest fleet, etc) and the dominant fashion in which they won (with the exception of the late-game English battle fleet), the Spanish are relatively satisfied with the rivalry for now. Looking ahead to more epic conflicts, the future is murky. The Spanish aren’t participating in CG2, so the Pirates don’t have to worry about them there. The World game is due to begin at some point, but the home territories of Spain and Singapore promise to keep the factions apart for at least a little longer. Of course, it’s only a matter of time before they clash again. Even in my latest game they were at it again! Crazy enough, the Pirates and Spanish have home islands near each other in BOTH The Hourly Campaign AND VASSAL Campaign Game 4! I don’t want to speak too soon, but it’s hard to imagine them NOT clashing in at least one of those games, especially given the history between the two factions. In fact, there’s already some tension between them in THC…. There hasn’t been a rivalry like that in any of my campaign games, yet. There have been game to game animosity and hatred, such as Spanish and American in the first and second CoE test games. In CoE in 15, there were two main rivalries, the Spanish and Pirates; and the Americans and Cursed. The Spanish and Pirates started the first war of the game, with the Pirates launching a small HI raiding squad that was repelled by the Spanish. The Spanish followed the Pirates home and almost eliminated them. They were forced to spare the Pirates due to Cursed activity. Later on after re-building a little, the Pirates assembled a sizable fleet and sailed en-mass on the unguarded Spanish HI. The Spanish responded by fighting their hardest and repelling the Pirate attack, effectively taking them out of the game. The Americans were dominant in their western part of the sea, putting down the English and expanding their empire. The Cursed launched a significant battle fleet, and used Becalmed twice to get the first shots on the Americans. However the Americans fought back and eliminated most of the Cursed battle fleet, effectively taking THEM out of the game, combat wise. The Americans then fought an English battle fleet, backing the English all the way to their HI, and were eventually proclaimed as winner of the 2015 CoE. In the Economy game, the Pirates and Cursed were not present,and the great rivalry of that game was the two fold, the Americans and French, and the French and English. Though the Spanish were present, they were not a factor until late in the game, thus taking them out of rivalry contention. The battle between the English, French and Americans dominated that game and made each faction hate the other. The next campaign game was this year’s CoE, in which their was only one real rivalry: Cursed v. Everyone except the English. The Cursed and Americans contested the middle ocean, with the Cursed pushing the Americans back, for a time. The Pirates tried to take gold and resources from within the Cursed’s sphere of influence, for which the Cursed attacked them with almost everything they had, sinking the Pirate launched Baochuan, and destroying the Devil’s Maw fort for a time. The French sailed south around the English and Spanish and tried to forcibly take Cursed territory, which met with mixed success. The Cursed fought back, but were weakened from the ongoing conflicts with the Pirates and Americans, and Spanish to boot. This resulted in a slow decline for the Cursed, which opened the door to the renewal of the French-English rivalry. For this Winter’s campaign game, there will be no factional divisions, it will instead be player divisions, with me against my two brothers and perhaps our friend from the Economy game. Thus it will be a rivalry of persons, like CCM’s great campaign in 2011. Also, the examples don’t have to be from campaign games or anything – I’m aware that Xerecs and I are mostly the only ones that play them. I just remember them a lot better than all the little games I’ve played, and a larger and longer game naturally has more potential for a rivalry than an hour-long game. As a matter of fact, I can’t really think of specific factional rivalries within smaller games over the long haul – I’ve played so much that everyone has warred with everyone multiple times throughout history! This post is reserved for those ships that performed spectacularly well (heroic) or atrocious in individual games, to the point of absolute disbelief. Oftentimes a “hero” ship will be an unexpected one – you expect HMS Titan or the Acorazado to be a big-time ship, so those types of ships aren’t as likely to be mentioned here. (though you still could if they were insanely good and better than they actually are) Of course, on the contrary, unexpectedly bad ships would be ones like the Titan – ships that are supposed to be amazing, but disappointed you in a specific game or did horribly on more than one occasion. What ship or ships (or crew, if you can manage that!) have been “heroes” or downright garbage in your games? For me, my Economy Edition game featured at least 3 good examples. The San Estaban had an absolutely heroic performance for the Franco-Spanish, shooting a whopping 8 for 9 (with rank-3 cannons, which I usually miss with all the time, so I’d expect her to go about 2 for 9) and surviving 2 full-scale Cursed attacks. She then returned home and may have shot some masts off Pirates before succumbing. On the opposite end of the spectrum was the Black Mamba. In one of the worst performances in naval history, this ship went 0 for 6 in two shoot actions. Think that’s bad enough? Three of those misses were 1’s, which meant that the ship had dismasted herself without doing ANY damage to the enemy. The Swiftsure was the first ship launched in the game by any faction. Used as a treasure runner by the English, she’s now picked up a captain from their HI since she has a 2S cannon, which is better than the other guns English treasure runners are carrying. She hasn’t done much damage, but the stubborn sloop is putting up quite a fight! Neither the Kettering, Saratoga, nor President can hit her because of her L-immunity. Frustrated, the President has rammed her, but miraculously rolled a 1 to miss the dismast attempt! With Peregrine Stern giving +1 to boarding rolls and the President having a 3 mast advantage, the boarding attempt looked like a lock. However, the Swiftsure rolled a 6 to the President’s 1, winning the boarding party 7 to 6 and killing Stern, one of the most valuable named crew in the game at 9 points!! Other atrocious performances include 10 masted ships in general, especially during my RISK game and Defence of St. Helens game. In terms of numbers, I do know that the Shui Xian and Baochuan combined to go 2 for 13 in one turn, despite the Baochuan having Chang Pao aboard. Also, HMS Grand Temple had a rough start to her career with me, but has more than made up for it by now. I’m sure there are other examples from my games, but I’ll post them as I remember them or rediscover them in the Battle Reports. Post your own surprising ship performances in the comments below! They’ll never be the best gunships in the game, and not many qualify as the best gold runners either. However, I have a love for the 2 masted schooner ship type. They are sleek, elegant, and even beautiful. They look really cool and fast on the ocean/table, and many of the ones from their first two sets are what I would define as “classics of the game”. Click the pictures to see the game piece pages at Miniature Trading (assuming that site still works as you read this). The first of MANY excellent 2 masted support gunships in CC and RV, and not just among the 2 masted schooners. The RJ is just perfect as a support ship: great speed, very good cannons, and a nice offensive ability. Throw in a crew from much later in the release schedule, and you even have a decent hybrid option. One of my very first ships, and arguably the best of the Pirate 2 masted schooners. An even better hybrid than the RJ, the Raven combines wicked speed with good cargo and good guns. Lots of crew options exist, and with the right setup, you can have a “super hybrid”: fight, get gold normally, or steal gold with the immunity to pinning. One of the best English gold runners, and a stacked ship for cargo in general. She can get a lot of gold from wild islands, or combine that with robbed loot. HMS Goodfellow from RtSS (12 points, 5 cargo, S+S speed, Secret Hold) would have provided some competition for her. Her ability is not on par with the others listed here, but this is still a good gunship given Spain’s other options at this point cost. A dedicated fort-wrecker can be a nice thing to have againstParadis de la Mer , or campaign games in general (she did well in CG1 against the French). Along with the Raven, this was the fastest ship of my original collection. Unlike most of these other ships, she’s not going to be a good hybrid or gold runner. However, the Mercure can still be a good “assassin” type ship, with blazing speed and accurate cannons. You could substitute a helmsman for a firepot specialist, or maybe even get Lady Roimata (Captain + SAT) with a firepot specialist and oarsman. Almost identical to the Royal James, but with a far less practical ability. The most offensive of this ship type, and one of the most devastating 2 masted gunships in general. Quite pricey, but you get great firepower that can wreck cargo on enemy ships. A captain, helmsman, and musketeer would make this ship quite fierce, or you could try using her as a hybrid with Hammersmith and Coconut . France has much better options, but this is a fun ship to use with equipment. An underrated gold runner, I consider this ship France’s answer to the Lady Provost. Not quite as much cargo, but a nice defensive ability. I’m sick of her, but this is one of the best gold runners in the game. Almost the same as the Mercure, but slightly worse firepower. A very nice option for towing Minuteman , and again, a firepot specialist on that 2S gun can really give the ship some bite. That covers the good ones; although there are some subpar 2 masted schooners, this ship type may have a higher percentage of good/great ships than almost any other ship type (5 masters come to my mind as possibly the best on average since there aren’t many mediocre ones). The Flying Fish , Black Arrow , and Glaive (underrated in my opinion) are playable, but the others aren’t as much. Anyway, really wanted to post this at some point, and I hope you enjoy the aesthetics and gameplay of this ship type as much as I do! What was your original collection? I got into this game back in 2005 (soon after CC came out I believe, but I only remember SM packs in the store), and I purchased a small amount of stuff from the first 6 sets, excluding SCS of course. This is my original collection of 49 ships that I hold dear to my heart, and these ships are the truest veterans in my entire collection of ~800 punched ships. They’ve been involved in the first-ever Historical Fantasy Scenarios I had, as well as numerous regular games. This was all I had until 2010 or 2011. The first and biggest ship(s) of each faction were the flagships. The battles between the two Gargantuans vs. the Enterprise and Magnifique were legendary, with the Lord Walpole and Birkenhead often giving the English a victory late in the battle. The amount of Pirate ships sometimes led to a coalition between all the other factions to take them out. The Raven and Mercure were overly fast scout ships that no other fleet could match. In the end, my love of the English usually made them prevail, but it was a fun time indeed. Of course, your original collection may be quite different than mine, especially if you bought hundreds of ships at once to start out. It could even just be the first pack or first 5-10 packs you opened, or like me, the first batch you had for quite some time before acquiring more stuff much later on. So, what was your original collection? If I had to pick “my” flagship, it would have to be HMS Lord Walpole. HMS Lord Algernon is technically my favorite ship, but more because I wanted it so bad back in the day. That being said, HMS Birkenhead was always right up there with the Lord Walpole, while La Magnifique or the Broken Key would be my top non-English flagship back then. @Xerecs: Your post reminded me of something I meant to put in my first post of this thread. How could I forget the “lost 3”? The Belle Etoile was simply lost as far as I know. I believe L’Eroica was lost as well, though she may have been badly damaged during construction, after which point I may have thrown her out. The Straw Man was not so fortunate… I had a really bad day and decided to take out my wrath on what I considered my worst ship (from a gameplay, HFS, and artwork perspective). I crushed it in anger, sitting and possibly stomping on it, which I later regretted. I have since acquired another one, but I don’t think I’ve used it and I don’t think I will. With those 3 it would have been 52 ships. Also, we have some similarities – we both got a Santo Columba, Swamp Fox, and others very early on. I’ve talked extensively about how my collection has grown in a Pojo thread. Ironically that thread was posted 5 years ago yesterday. It also confirms that I did indeed come back from my long hiatus in 2010 rather than 2011. I may have lurked here longer than I thought (perhaps more than the month that I recall), but I don’t remember much of it haha. I bought 55 ships from Strikezoneonline for $10 (+ $10 shipping) in order to get as much quantity as possible. This was literally just to have as many ships as possible for my Historical Fantasy Scenarios. That purchase is also where my 8 Mayfair’s came from. I had an idea recently. I LOVE naval history, especially during the Age of Sail. I like reading books about the topic of course, but also the convenience of going on Wikipedia and reading about various wars and battles. I would like to start a “Pirates CSG Naval History Wiki” that documents games in a new format. It would pretty much be completely derived from Battle Reports, but it would be in a Wiki-style format almost exactly the same as a Wikipedia entry. I’m mostly doing this out of a pure passion for playing, BR’s, naval history, and my/our own “alternate history” that parallels the actual Age of Sail. It’s a VERY long-term project, and I have TON of other Pirate things to do first. Not to mention that my older (non-campaign game) BR’s are ruined due to the photobucket crash, and I would also like to work on that (likely replacing them with videos instead of redoing picture links only to have postimages.org disappear suddenly). It could be open for others to edit so everyone could add their own battles and games to the full “history of Pirates CSG”. Interesting idea. Like super battle reports. XD I’ll help when I can, but as you said this is an ambitious undertaking…..
It’s not exactly what you’re talking about, but I’d love to see a compilation of the story elements that unfolded over the course of the game. Try to make sense of what happened to the various factions and characters over the life of the game through the little bits of flavor text that were on the cards. I’m pretty sure no real-life pirate remained in the profession over such a wide geographical range as our Jack Hawkins. Check out this wiki started by godmason! I’d like to contribute there as well, but I’m much more a fan of epic games than the flavor text (which I still love, don’t get me wrong). I think it’d be cool. I don’t think it’ll get a huge following, or participation rate, even from the active community; but, for those that do add to it, and for yourself, it’ll be worth it once it gets that half a dozen, dozen, two dozen, etc. on there for the community to look back on. I’m not expecting it to; it’s literally almost a long-term gift to myself. XD I just love the thought of having “my own Wikipedia” as far as history goes, but of course for this game since there are already entries on the real battles fought in the Age of Sail. With the new year approaching, I’m thinking about doing an “anniversary” approach: creating pages as the days of past battles approach (for example, I would create an entry for the Experimental cumulative game in January and just go down the list of battles and games throughout the year). Unfortunately I certainly won’t have time to keep up that pace (especially during the summer craziness when a ton of CG’s have been played), but it’s a super long-term project I’m excited to embark upon. I have a new idea on this. In addition to making pages for battles and wars, I could make pages for individual ships. Through the years almost every ship I own has appeared in at least one campaign game, with collection veterans like HMS Titan appearing in almost ALL of them. This provides an opportunity for something I might call “Ship Chronicles”. For example, I can recall that the Grendel was beat up by a huge iceberg in the FN anniversary game, and then fought the Cursed in multiple battles in Command the Oceans. Telling a ship’s story could help bring them to life and almost provide an “alternate flavor text” type of thing. Of course the main problem would be using ships again in games after they’ve sunk in others, but I guess we could just say the faction rebuilt the ship. As I republish this on my fansite here, I have gotten even busier and have literally dozens of Pirates CSG tasks and goals to accomplish LONG before I’d ever even be able to start a massive project like this. Besides, I’d rather just play THC instead for the time being. I’d love to do this someday, but it will probably be near the bottom of my priority list for DECADES… maybe look for something on this in the 2060’s or something lol. (assuming I should still be around then) In addition, given the potential demise of wiki’s, it would definitely be something I’d have to own myself. I would make sure to own the domain (and maybe more than that) in order to even start something like this that would be a lot of work. Who knows, maybe I could even make it work here on Pirates with Ben? Feel free to comment your thoughts on this idea in the section below. I’ll make sure to respond!